To improve the survival rate of patients with gastric cancer, several therapeutic modalities have been introduced to the field of clinical trials. 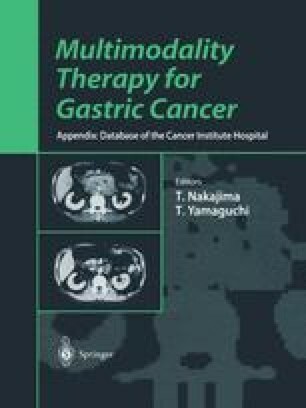 Among those modalities, the concept of neoadjuvant chemotherapy has been developed to manage the far-advanced gastric cancer. FLEP-5-fluorouracil (5-FU), leucovorin, etoposide, and cis-diamminedichloroplatinum (CDDP) —therapy, which was introduced by Nakajima , is one of the neoadjuvant regimens. The development of this regimen was based on the results of previous evaluations showing the excellent role of biochemical modulation of 5-FU with leucovorin and the synergisms between CDDP and etoposide [2, 3, 4] and between 5-FU and CDDP [5,6]. The effect of chemotherapy depends on the drug concentration at the tissue level. Usually the drug concentration in tumor tissue is higher with intraarterial infusion than with intravenous infusion. Systemic drug toxicities are expected to be less with intraarterial administration than with intravenous injection . According to the above-mentioned rationale, changing the administration route from intravenous to intraarterial may become another way to enhance the efficacy of chemotherapeutic agents. Investigators have tried to evaluate the clinical results of FLEP therapy according to the route of administration, such as intraaortic (IAo) or intravenous (IV), in patients with unresectable gastric cancer.